On this page you will see examples of classic Winnie the Pooh Baby bedding, nursery accessories and decor ideas to compliment your 100 Acre Woods nursery theme. We have pictures of rooms decorated for baby boys and girls where you will see how their moms used the various crib sets and wall decorations and other themed items to put the finishing touches on their baby's room design. When it comes to colors; the color combinations possible for decorating in a Baby Pooh theme are all over the map! Winnie the Pooh and Friends are an eclectic mix from the blue-ish purple of Eeyore to the bright pink of Piglet. What most parents love is that they can take things in a unisex or gender neutral direction to get more mileage out of their efforts. If you are decorating a twin boy and girl nursery , this may be the perfect room theme for you. 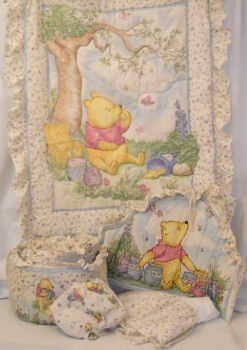 A Winnie the Pooh baby nursery theme is a peaceful theme that will allow you to explore a broad range of colors. Go bright and bold or tone things down to the soft colors of a watercolor painting. Go HERE to see a list of favorite Pooh Bear sayings that can be printed and framed as part of you wall display as well as the largest collection of classic Winnie the Pooh pictures around. As you can see from this picture; a pink and yellow nursery for a baby girl in a Winnie the Pooh theme is very easy to decorate. How to paint the nursery walls in classic Winnie the Pooh fashion is entirely up to you, but here are some nursery wall painting techniques and ideas that you might want to try! Use free stencils to do some lettering on the walls in a random pattern. Stamp some pictures of Winnie the Pooh characters featured in the stories around the room as a do it yourself Winnie the Pooh wallpaper border! Winnie the Pooh murals make a large display. You can make the DIY nursery project much simpler by using Winnie the Pooh pictures, prints or stickers instead of painting the characters yourself. If you can't find Winnie the Pooh curtains and nursery window treatments that you like, consider making your own using one of the classic Winnie the Pooh fabrics that are available and make them yourself! There are some really cute toile patterns as well as modern, multi-colored selections. It is worth the money to pay someone to make the window treatments for you if you don't sew but even a beginner can manage a gathered valance. Even if you hire someone, it's worth it to get the look that you want for the baby's room. Take care that you don't crowd too many images and collectibles featuring Winnie the Pooh and Friends into your space. 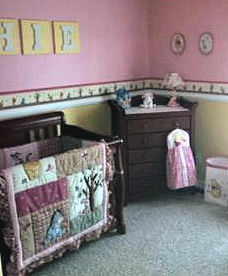 You could end up looking more like a Disney store than a tastefully decorated baby's nursery. Here are some Winnie the Pooh baby room accessory ideas. Frame some free printables of Winnie the Pooh. There are pictures of Tigger and Winnie the Pooh and most all the other characters from the story. What an inexpensive way to decorate your nursery walls! Winnie the Pooh Crib sets are great, but you can add to the classic Pooh baby bedding with a classic blue satin trimmed security blanket in blue for a baby boy's nursery. For a baby girl's room theme, you can get a pretty pink fleece blanket. If you're taking the unisex route a green lovey or security blanket trimmed in green would work. Arrange some special occasion Winnie the Pooh baby bath products on the changing table. You don't have to use them for each and every diaper change or you can refill the decorative bottles and jars with less expensive or generic baby products when you run out of the expensive stuff! All the Winnie the Pooh stuff for baby is easy to find and most are for sale at reasonable prices, but there are always sales to shop! You may be able to get some discontinued Winnie the Pooh baby items from last season at bargain prices! Look for coupons, sales and promotions to see if there's any Winnie the Pooh baby stuff that you can use! I hope that visitors to Unique Baby Gear Ideas have enjoyed our recommendations for getting the most out of what I consider to be one of the most versatile nursery themes and will drop back by when you're done to share pictures of your decorating project.